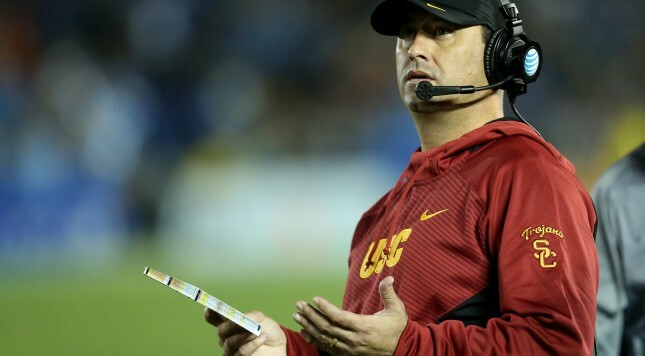 Things just keep piling up for USC head coach Steve Sarkisian. It all started when he delivered a drunken rant at the “Salute to Troy” kickoff event on Saturday night, which caused him to be pulled off stage by athletic director Pat Haden. Since then, the media has been digging in an attempt to uncover more about Coach Sark’s past. ESPN’s Danny O’Neil found an interesting nugget which dates backs to Sarkisian’s time spent at the University of Washington, where he was the team’s head coach from 2009-13. Sarkisian reportedly ran up a $600 bar tab back in 2012, and attempted to expense it to the university. It’s unclear as to who ended up paying the tab.